Google is the most popular search engine, with over a billion users. 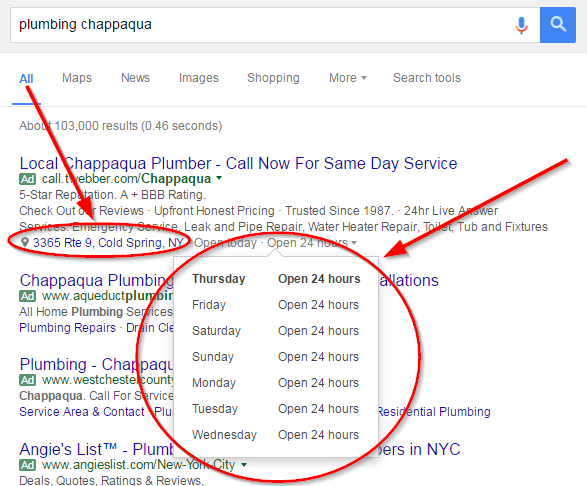 Therefore, you want to make sure your local business information is listed accurately on Google’s results page. Luckily, Google puts you in control of your own information, so you actively manage your presence on Google. Where Will Information from your GMB Page Appear? For a complete guide to ranking on Google, go here. If you want a better understanding of what Google is and how it works, start here. Google My Business (GMB) is a free dashboard where small businesses can manage their presence on Google’s search engine. When someone searches for a business on Google, information such as phone, address, reviews, etc. from their Google My Business page will populate on the results page. All of the information in the red box below came from that business’s GMB page. 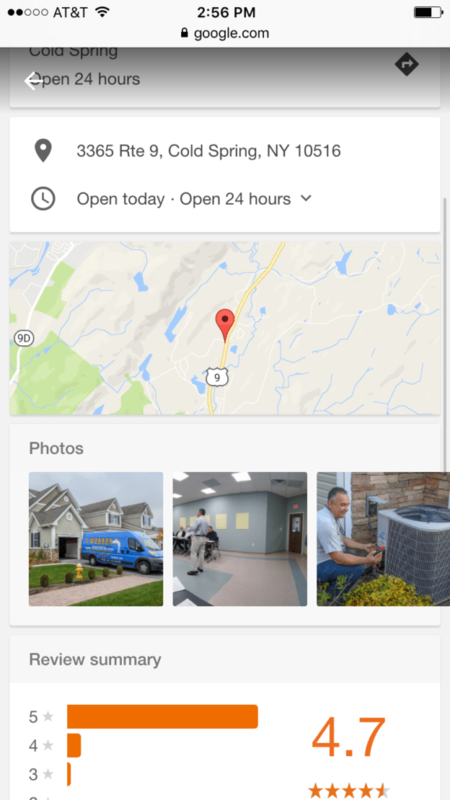 Where Will Information from your Google My Business Page Appear? The information from your GMB profile will show when someone searches for your business or for your type of business on Google. Having an accurate and fully filled out profile with pictures and reviews will help your business look more robust on the results page. It will also increase the chances of your website being listed on the results page. This section, known as a knowledge panel, can appear when someone searches a business by name. 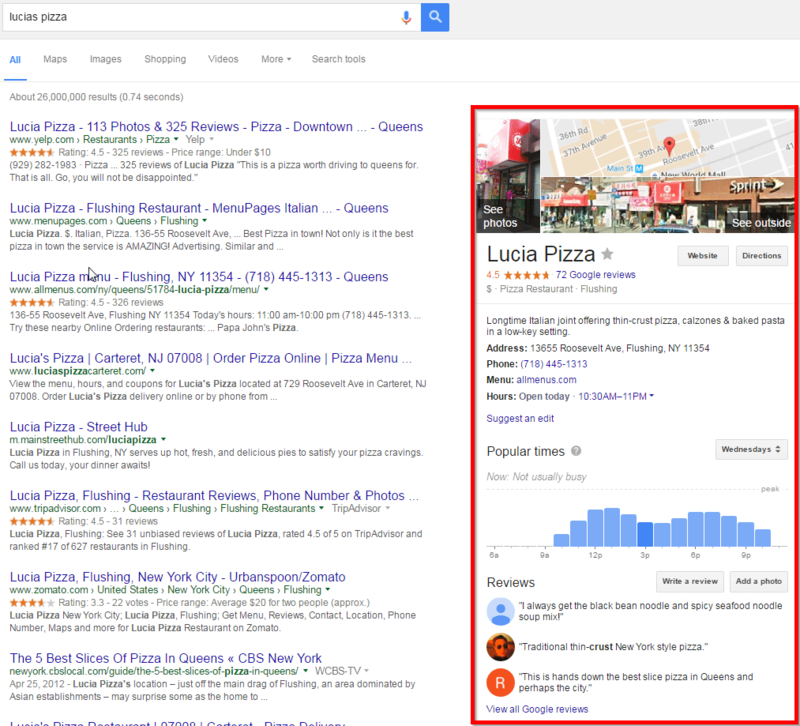 All of the information listed in the image comes from Lucia Pizza’s Google My Business Page. If you do not have a GMB page, you are missing an opportunity to take up a lot of real estate on the results page. The same information for a business is listed on mobile devices, but the bar will be at the top of the screen, instead of on the side. 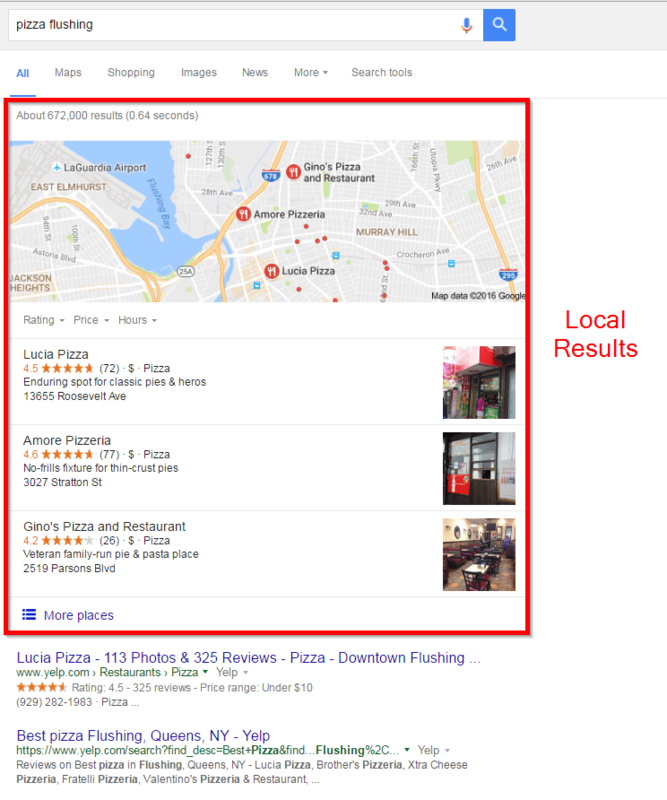 The local results section of Google shows three businesses that are near the location term (i.e. flushing nyc) used in the search. Your information can show in local results when someone searches terms related to your business. 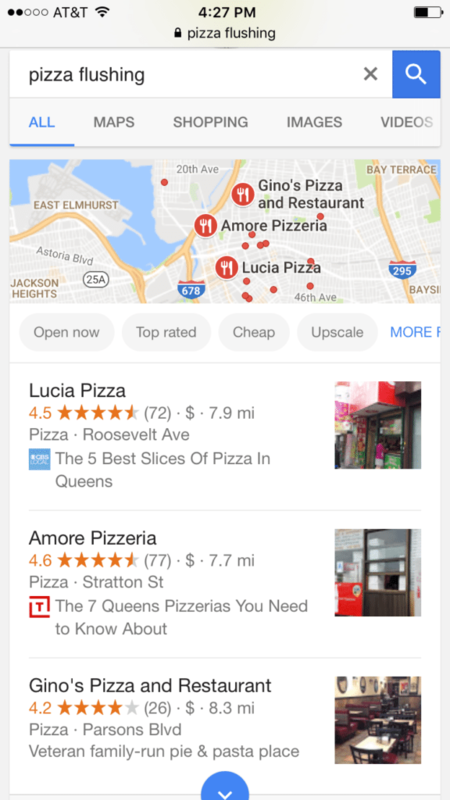 As you can see from the picture, these pizza spots have reviews, price, category, description, address, and a picture all coming from their Google My Business Page. Three restaurants will also show when someone does a Google search on their phone. 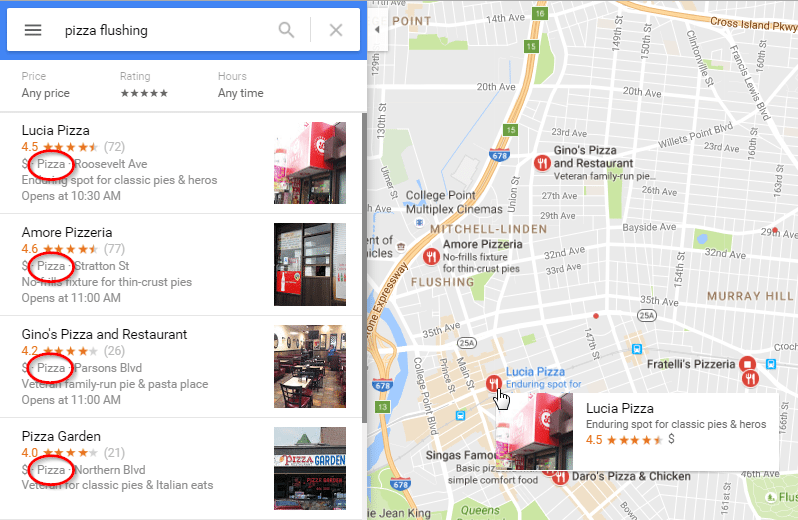 Google pulls similar information from your GMB page for mobile searches, but instead of listing the address, Google will show how far a business is from the searcher’s current location. 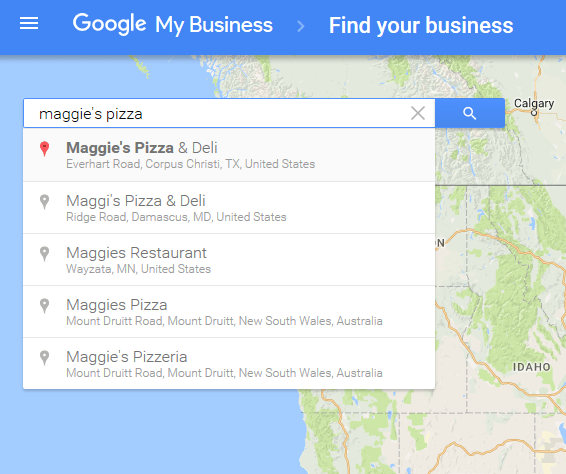 Your GMB information shows when someone searches for your type of business on Google Maps. Notice that every result that displays for the search term “pizza flushing” has pizza listed as their category. This is important to note because if you have not claimed your business and listed a category on your GMB page that describes what your business offers, Google will have a hard time knowing that your business matches the search term used. 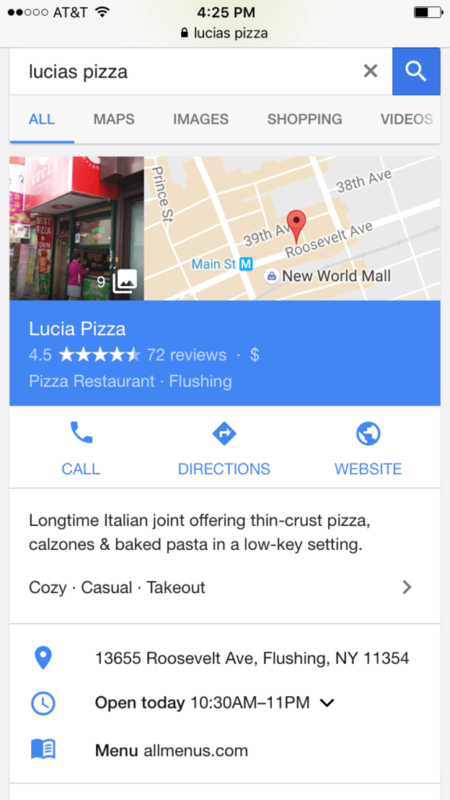 The screenshot above shows what appears when someone searches “pizza flushing” into the Google maps app on a phone. You’ll notice that each restaurant has reviews, address, description, price, picture, and hours of operation listed for their business. 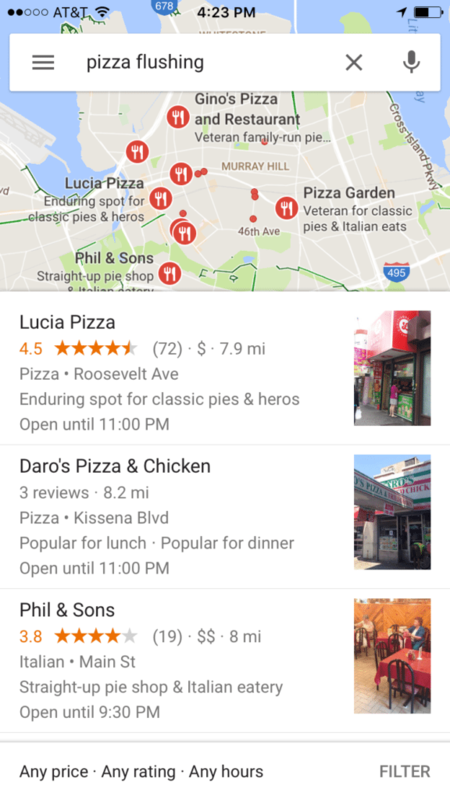 If someone is searching for a type of business in Google maps on their phone, it is extremely likely that they are looking to visit a store at that moment. For that reason, you want to make sure the information on your Google My Business page is accurate. This helps customers can find your business and helps your business stand out from the competition. As you can see, your Google My Business page determines how your information will show on the Google results page. Since you are in control of this information, you should make sure all of your information is listed accurately. If you do not complete the details of your business, Google will do its best to determine your location and other relevant information. However, Google is not foolproof, so by not claiming your business, you run the risk that inaccurate information will show for your business. Bonus: Download our free SEO Guide that will show you how to rank your business in the top 10 results on Google Search! Now that you are aware of what creating your GMB page can do for you, let’s get started on setting up your account. Go to google.com/business to search for the name of your business. You will need a Google account, so if you don’t already have one, you can create one for free here. Next, you’ll want to search for the name of your business. If you see yours listed, click on it and you will be able to authorize that you are associated with the business. 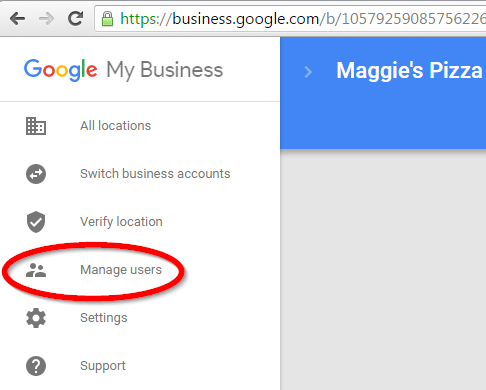 Note: If you are having a third party manage your Google My Business page, make sure that they set up the account under your email address. That way you will be able to edit your own business page if you ever part ways. After you setup your page you will be able to add users who can edit your page in the top left corner. What if someone has already claimed my business? 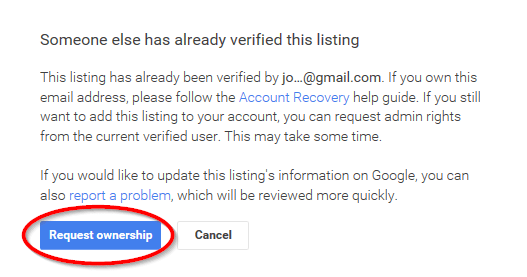 If you go to claim your business and get a message that someone has already verified your listing, first you want to make sure that you don’t have another email address that you could have used to claim the business. 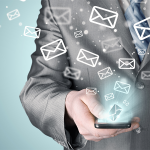 If you are sure that you or one of your business associates did not claim the business, you can contact the owner directly using the contact information in their business listing. If you can’t reach the current owner, then you will be taken to a screen to request ownership. Clicking “request ownership” will take you to a form to request the current owner to transfer ownership to you. If you don’t see your business in the drop down, click the magnifying glass and hit “add your business.” You will then see an image like the one below. You will be able to add your address, phone, and business category. Make sure the category is descriptive of your business, because this a big factor that Google uses to match searches to a business. Have a standard address – Make sure the address you put here matches the address on your website and the one you are using across different directories (such as Yelp, TripAdvisor, etc). This is important because in order to rank higher in the search results, you need to have a consistent name, address, and phone number (NAP). You will not be able to enter a P.O. Box here because Google does not consider this to be a physical location. Use a local phone number – It is best practice to use a phone number with a local area code instead of a toll free number. This will add credibility to the fact that you are a local business. Choose the right category – The category section is important because Google uses the category you choose to match searches to your business. Select if you deliver or not – If your business delivers products or services, you will want to let Google know at this point. Then you will be prompted to select the radius you deliver to. If you also serve people at your business address (e.g. a retail business or restaurant), make sure to check the box at the bottom, or else your address will be hidden from the public. 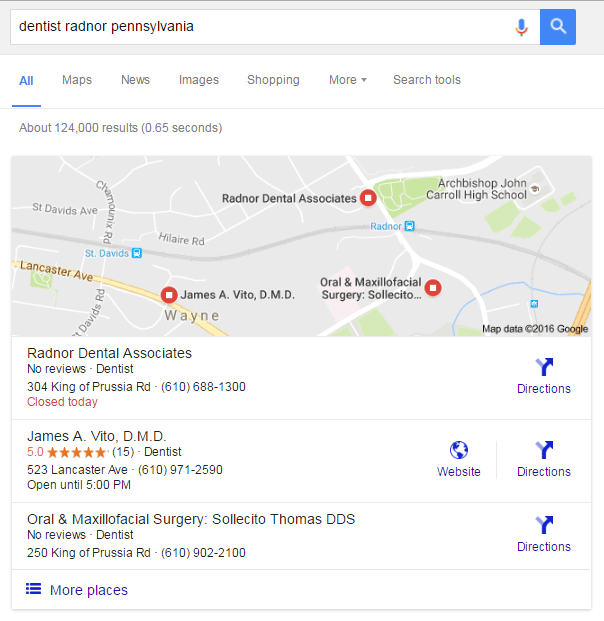 Do I need different Google My Business pages for each of my locations? 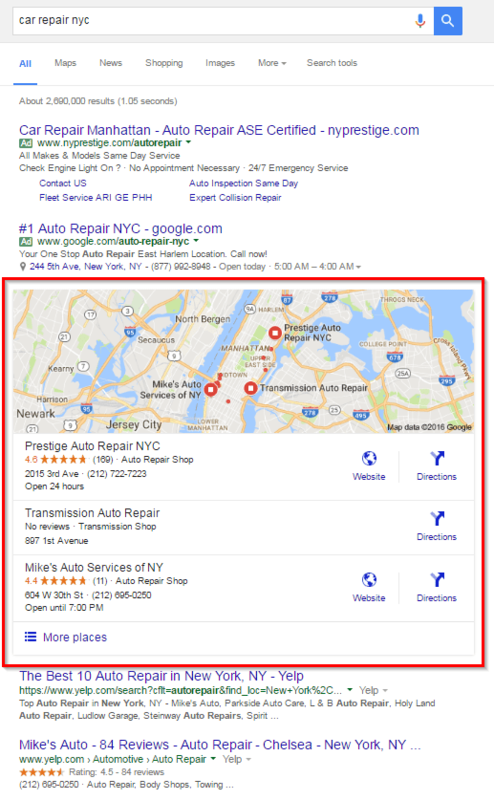 You will only need one Google My Business page for all of your locations. However, you will have to add and verify one business location at a time. You will be able to update information for each of your locations, and there will be separate reviews. If you have more than 10 locations, you are eligible for bulk verification. Find out more here. Next step is to verify your business by mail in order to let Google know that your business information is accurate and valid. Google will send you a postcard to the address listed with a verification code. You will then need to enter your code on your GMB page. Once you have verified your business, you will be able to access the insights and reviews section of your profile. How do I verify my business on Google My Business if I have a P.O. Box? Google will not allow you to enter a P.O. Box as your address because this is not considered a physical location, and Google is trying to prevent spam. If you do not have a storefront because you deliver your product to the customer at their location, you can verify your business by using your home address. Google won’t make the address public, as long as you mark that you do not receive customers at this address. The steps to create your page have been fairly easy up until this point, but this is the part that will take a little more time. It is also the step that you want to really focus on, since the more information and the more detail you are able to include on your profile, the better chance you have of ranking in Google’s results page. Website – Add your website here so people can be directed to your landing page. If you do not have a website, you can learn how to create one here. You will need to verify your website in order for it to show on your profile. Verifying lets Google know that you are the authorized owner of the website URL. Hours of Operation – Make sure you have accurate business hours listed. This information will show across Google and will even warn people who are using Google maps if the business they are trying to get to will close before they arrive. Photos – People love to see pictures of a restaurant or store before going. Make sure the pictures you add are representative of your business and also visually appealing. If you own a restaurant, make sure to include pictures of your food. You will also be able to add pictures of your menu, and pictures of your team. Virtual Tour – Including a virtual tour will allow customers to get a sense of your business before they even arrive. This is not necessary, but if you have the time, including a virtual tour could increase your Google ranking and draw people to your business. Profile Picture – This is the main picture people will see when your business shows in the Google results. People often show a picture of their storefront here, but you can get creative in order to grab people’s’ attention. Description – Your description should be short and to the point, but also include keywords that you think people will use when searching for your type of business. So if you own a fast food restaurant, some terms you may want to include in your description are “burger” “fries” and “fast food”. Now that you have set up your Google My Business page, you want to focus on the reviews section. Reviews are likely a ranking factor that Google uses to determine which businesses should show on the results page. Your reviews will show along with your location information, and people are way more likely to visit a business with multiple positive reviews. For example, which business from the local results below would you want to visit? If you don’t have any reviews, start asking loyal customers if they would be willing to leave a review. Don’t be too pushy, but hopefully if you’ve served them well, they will be more than happy to leave a review. Just be careful about asking for people to leave a ton of reviews at once. Google will notice if you go from zero to a bunch of reviews, or if a lot of people that have never left a Google review before are leaving them for your business. We have a full guide to online reviews to help you get started. 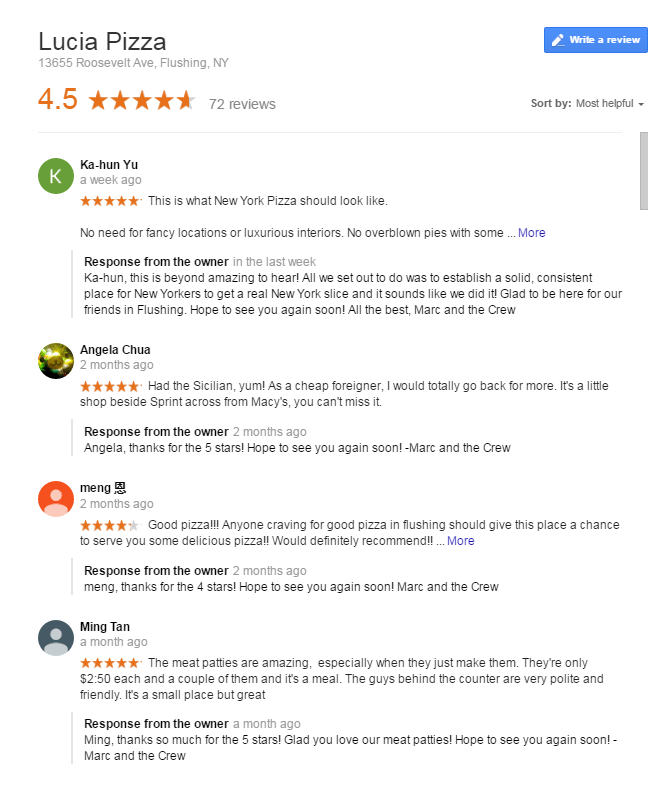 Lucia Pizza is an example of a restaurant that does an awesome job not only getting customers to leave reviews, but also of responding to reviews. It’s important to respond because interacting with your customers will give you a boost on the Google results page. To stay on top of your reviews, you can have Google alert you when someone leaves a review on your page. To do this, go to your settings and enter the email address you want these alerts sent to. Possibly even more important than responding to positive reviews, is responding to negative reviews. You want to have the last word when it comes to your business, and responding to a bad review gives you the chance to explain yourself to other potential customers. Here’s an example of a good response to a not so positive review. Learn more about responding to negative reviews here. If you are advertising on Google, the last step is to link your Google My Business Page to your Google AdWords account. If you are not advertising on Google but would like to learn how, get started here. This will allow you to enable location ad extensions to show underneath your text ad. Ad extensions are a type of ad format that show additional information about your business. 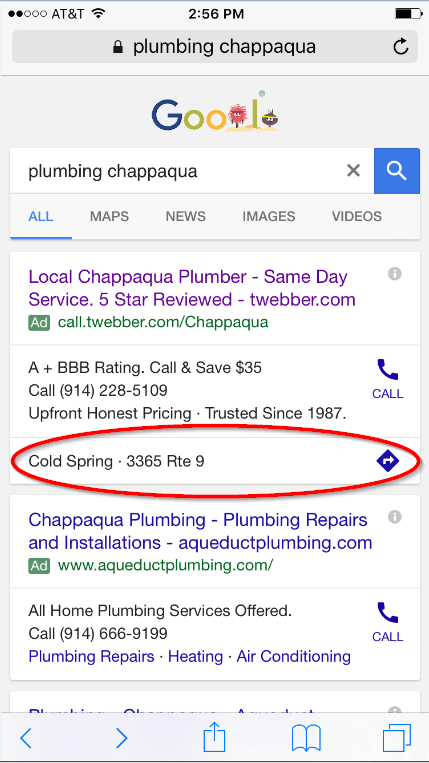 Below you will see that the ad for a plumbing company shows the address and hours of operation from their Google My Business page. On mobile devices, the same business as above shows with the address coming from the GMB page. 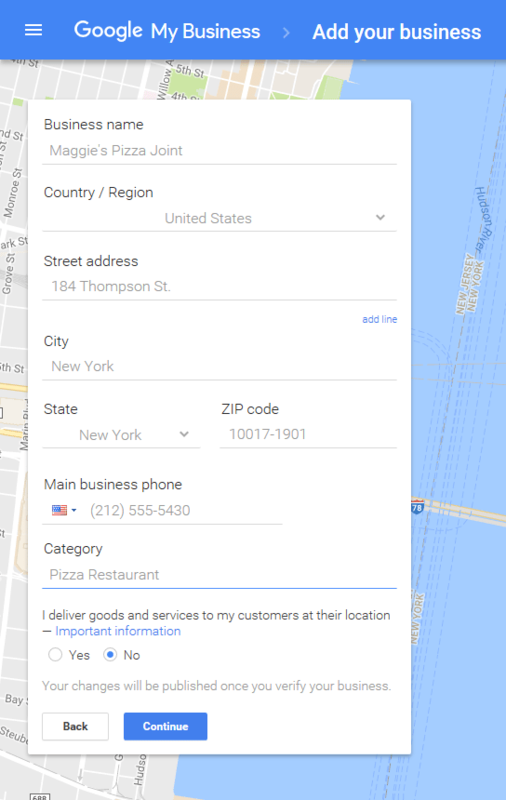 When you click on the address, Google sends you to maps and shows more information on the company. 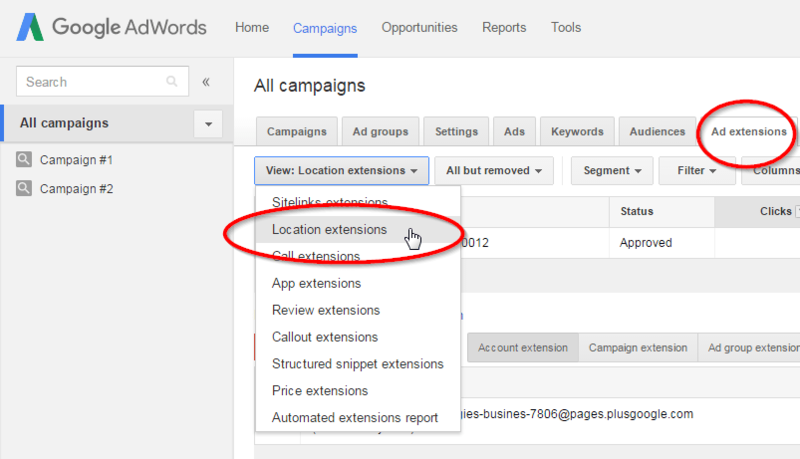 In order to do this, login to your AdWords account, and click into the “Ad extensions” tab. Then choose to view the “Location extensions.” Click “+ extension” and if you are using the same Gmail address for both accounts, your Google My Business page should show here. 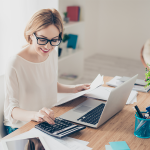 Setting up your Google My Business page will make it much easier for potential customers to find your business and know what you are all about. The amount of detail that is on your Google My Business page is completely up to you. Having more information will not only boost your rankings in Google results, but also give potential customers more to look at when deciding which business to choose. Sell your business on the GMB page as best you can to make sure you are standing out against your competition. Now that you have setup your Google My Business page, you’re ready to increase your pagerank on Google. Find out how here. I’m in the process of setting up a google my business account, currently waiting for the verification code which has been posted. Is it possible to run a google ad before the my business page is complete? You can set up Adwords and point the link to your website anytime. Here’s more on using Google Adwords. Hope this helps, good luck. I have a PRODUCT not a business. I see NOTHING that is helpful regarding a product as distinguished from a brick and mortar physical location. Do you service a product seller? Sure, we have an entire e-commerce section that covers everything related to online product marketing, sales, and fulfillment. For e-commerce and mail-order sales, you’ll need to focus on search engine optimization (SEO) for organic search results and search engine marketing (SEM), such as paid ads, for your website or product listings. Google has very different search tools for local versus e-commerce sellers, so the e-commerce tools like Google Webmaster Tools and Google Adwords, are what you should focus on. Hope this helps, good luck! id like to know the cost of getting linked to google search engine without waiting 6 mos on the web crawler. There is a sandbox for new website launches but the easiest way to get into Google’s index fast is setting up Google Webmaster Tools and submitting your sitemap, then getting links to a few of your pages from reputable sites. Social posts work, too. While waiting for that process to roll, you can always use Google Ads to drive targeted traffic to your site. Hope this helps, good luck! I want a google popup advert like the way cartradeview. com pops up on different websites. Can you clarify what you mean by this? Do you have a website, or do you want an ad for your product to show up on other third party sites? But does google update their algorithm quarterly or yearly? does it affect my online shopping business? According to Moz, Google updates its algorithm between 500-600 times a year. While most of these changes are minor, Google occasionally rolls out a “major” algorithmic update that affects search results in significant ways. This can sometimes affect how your website ranks on the search engine results page, and you may see either an increase or decrease in rankings. Check out Moz’s article on Google algorithm change history to learn more.